It all started in Bethlehem. From here, the Christmas message was revealed to mankind; a message of joy, love and peace. And here we are today, after more than 2,000 years, reviving this eternal remembrance in faith and love, happily cheering and singing songs of joy and triumph. “Glory to God in the highest, and on earth peace, good will toward men.” This verse spreads joy in our hearts and proves for us that nothing is impossible for God, not even realizing peace. Palestinians have always suffered from occupation and oppression, and still undergo violations of their rights. We live in a city surrounded by a wall that cruelly and severely obscures it, prohibiting its people from moving freely on their lands. Our hearts grieve for what our city has become, and it pains us to imagine what the birth of our lord Jesus Christ would look like today. Joseph and Mary would be stopped and searched entering Bethlehem or departing on their flight to Egypt. The Magi would run into a huge concrete wall. The shepherds would not be able to graze their sheep; their land would have been confiscated. 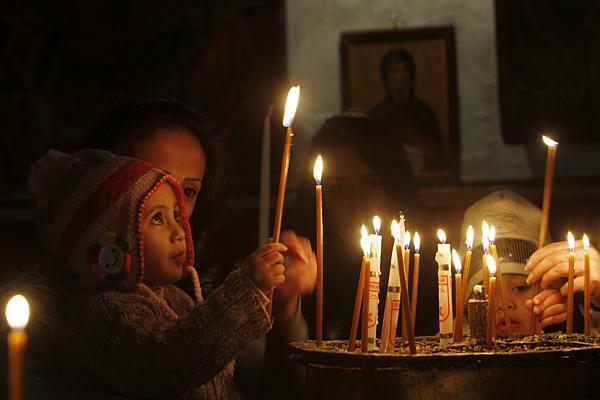 Despite everything, the hearts of the residents of Bethlehem are once again filling with hope as Christmas approaches, a hope which comes from the savior’s birth at the heart of the city. It brings to its people a message of love, peace and hope. During this season, hope shines in our hearts; it springs out from our faith in the power of the child lying in the manger to realize justice in this holy land. It is from this we derive our theme for Christmas 2011: Palestine Celebrating Hope. This year we are approaching the birth of our independent Palestinian state with bold steps forward. Nowhere is this progress clearer than in Palestine’s successful application to become a permanent member of UNESCO — clear evidence for our people’s culture and our country’s civilization and history. The birth of Jesus Christ has played an essential role in forming our humanity, refining our history and tolerating the injustice and persecution in our daily lives amidst an absence of peace. One day soon, we hope this occupation and blockade will fade from memory as Palestinians are granted their national and legitimate rights, and peace. Let us hope 2012 is a year of prosperity, tranquility and peace — for the holy land and the entire world. Victor Batarseh is mayor of Bethlehem. Adapted from remarks delivered Dec. 15, 2011.